Bleach Online allows players to immerse themselves and become part of the world originally created by writer and artist Tite Kubo, who spawned the Bleach manga comicstrips and anime that the game is based off. The game itself is a free to play MMORPG where players will meet and team up with many of the heroes from the series and do battle against some of the notorious villains as they crop up throughout the game’s storyline. 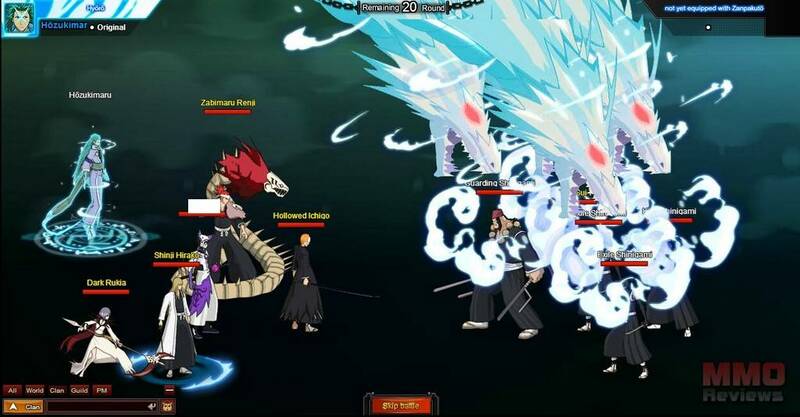 Bleach Online is a Flash-based browser game that can be played directly through the game’s official website and does not require any client side download. Ichigo Kurosaki is a teenager who is able to see spirits and upon meeting a Soul Reaper (a Death God) his life changes when due to an injury she sustained is whilst defending the boy from a Hollow (a Dark Spirit )she must transfer her powers and duties over to Ichigo who becomes a new Soul Reaper. Players begin the game as a seriously injured soldier rescued from a battle and after a 1000 year sleep is awoken and sent to meet Ichigo who will hopefully be able to help you remember your past life, who you were, where you came from and ultimately what happened to. The game is a point-and-click isometric browser MMO that focuses on players improving their party, its overall strength represented by the players Battle Power number, by recruiting on new companions to help you in battle the dark spirits. Players have full management over their party and must level them up, train them in new skills and equip them with powerful items to enable them to take on greater challenges. Gear comes in a variety of different forms and rarities that can be unlocked through a variety of means, from completing in game quests to simply logging in daily to receive bonuses and rewards. One of the primary strategic elements of the game is players managing their party Formation, a 3 x 3 grid split into three columns for front line Vanguard to tank most of the enemy damage, middle lane Assaulters who focus on dealing heavy damage and backline Supporters who focus on helping the party and hindering their enemies. Players are able to choose which of their companion characters go into which position in the formation, giving them the choice of focusing on defence, attack or support with a variety of different formations available. Once entering battle players have no more control over what happens and combat becomes automated where both sides exchange blow after blow until one side is defeated. Players gain bonuses when winning in battle based on how well they performed and what grade they acquired for the battle, though battles can often be repeated if the player wishes to get the max grade for that fight to earn greater rewards. Players can choose from six different available characters, made up of three different classes in both a female and a male version, each character has their own story that must be discovered. Players have a small amount of character customisation during the creation process where they can change their hair style, facial features and clothing with a few pre-set options. Looking for more Free MMO Browser-based games,Free MMORPGs,Free MMOs games? Just like any other “F2P” MMO I’ve seen recently – this game revolves around money – lots of it. I have great suspicion that there are hired games or just developers/owners/stakeholders who are given free in-game paid currency in order to get insanely strong and thus make others spend large amounts of money in order to catch up with them. Furthermore servers die pretty much within 1-2 weeks of being released due to such individuals. There’s very few remaining and trying to play a game which turns into single-player quite soon. Bottom line – unless you intend to spend hundreds of dollars – don’t even bother trying to play.